But, I was amazed at the results in Lightroom 3 Beta 2! For comparison, I also processed the files using the latest release of Capture One 5 Pro. To save space, I am only showing the image with Noise Reduction turned Off and Noise Reduction set to Strong (the extremes). The results are below. One curious note – Adobe processed both files (NR Off and NR Strong) identically. Since the Noise Reduction setting is just another tag in the Raw file, it is obvious that Adobe is ignoring the tag altogether. In any event, these results are better than Canon’s own DPP from my last article. The above image provides a screen capture of the setting used in both Capture One 5 Pro and in Lightroom 3 Beta 2. And remember, these images were shot with ISO6400! Lightroom 3 Beta 2 blew Capture One 5 Pro away! The results took only a few seconds of tweaking. Better results and even a time-saver. The white balance needs to be adjusted in Lightroom, but Wow! Adobe, I take all those nasty things back 😛 Now fix Camera Raw and all will be right in the world!!! Can you direct me to prior articles that explain your last comment regarding issues with Camera Raw? I am curious to know if you are speaking specifically to its performance with the 7D, etc. When I first tested out the 7D, I was beyond not pleased with the noise level but am wondering if it was a Camera Raw issue vs 7D issue. It was so bad, I caused me not to move forward with purchasing the 7D because I do shoot a decent amount of low light projects. Thank you! The problem lies with Adobe Camera Raw NOT the Canon 7D Raw files. I added the the links for the previous related articles above. I compared images captured in-camera as JPGs and the 7D Raw file processed through Canon’s DPP, Camera Raw 5.5/5.6, Lightroom and Capture One 5. The JPGs and DPP processed images look fantastic. Capture One 5 comes close to that level and adds more advanced settings. Adobe Camera Raw and Lightroom looked a generation behind. 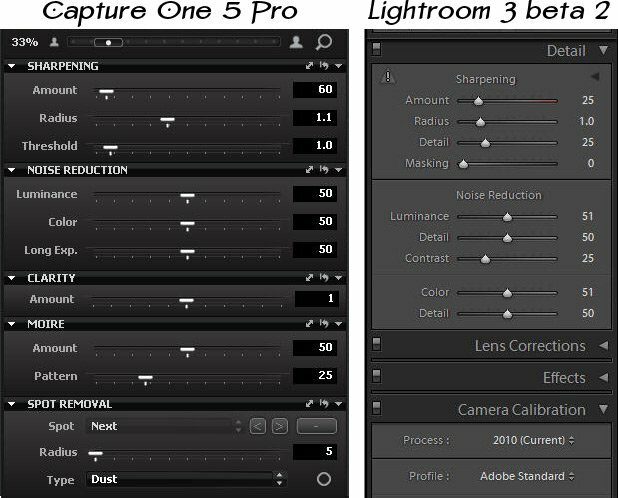 We now know why – Adobe was holding out for CS5 and Lightroom 3. Charles, I can’t tell you how much I appreciate the time and effort you are putting in dealing with the Canon 7D noise and Adobe converters. I’m hoping I won’t have to upgrade to LR3 or CS5 to get this performance, but at least I know there is hope. Well, take a look at the CD which was included with your Canon 7D. It includes Canon Digital Photo Pro (DPP) for processing Raw files. It does a fantastic job at processing the 7D Raw files. Also, check the Canon USA site for an update. The current version is 3.8.0 (dated 2/26/2010). Just came across your site, great to find some practical info on the 7D. Pleased to hear that Adobe have done something about processing 7D RAW files. I had no success emailing Adobe about the problems using Lightroom with 7D files, vague answers and no direct response to the actual problem. To minimise these problems I have been opening the RAW file in Canon DPP, using the default NR settings only, saving as a TIF file, then importing the TIF into Lightroom for any further processing. Works, but a bit of a pain. Can you tell me, do the RAW files appear ‘normal’ (ie correct exposure) in LR3 when compared to the same RAW file in Canon DPP? Yes, overall, Lightroom 3 Beta 2 is a huge improvement in processing Canon 7D Raw files. However, Adobe is Adobe. As such, Adobe thinks it knows better and will ignore certain tag settings in the 7D Raw files. I processed the same 7D Raw file in both Canon’s DPP and Lightroom 3 Beta 2 (as well as Adobe Camera Raw 5.7 and Capture One 5 Pro). Check the links at the bottom of the article. The exposure across all files was very similar. Lightroom 3 was a little off in White Balance compared to the others. This was very obvious in the flesh tones. You can download the latest beta at Adobe Labs. Thanks Charles, will try out Lightroom 3 B2. As I have Lightroom 2.6 installed, will check I can load LR3 on same machine without problems. You may have a problem that I encountered reprocessing the same file with LR2 and LR3. In Beta 2 of LR3, you will need to select which algorithm to use. You want the 2010 version to see the improvement. You will a triangle with an exclamation mark in the corner of the preview window if this is a problem. I know it’s been many months since this article was first posted, but I just came across it while looking for information for a similar problem with photos opened in CS4 with Camera Raw 5.7, using a Canon 50D. I got the camera some time ago, and had to upgrade from ACR 5.0 to 5.7 to be able to read the new RAW file format into CS4 (camera wasn’t supported with ACR 5.0). This is when I noticed the noise issue. I first had my RAW files opened in ACDSee 12.0, where they looked fine, but terrible in ACR 5.7. I just downloaded and installed Lightroom 3.2 RC after your recommendation, but I unfortunately don’t see any difference! The pictures look just as fuzzy as they did in ACR 5.7….any idea why? I haven’t tested with DPP yet. 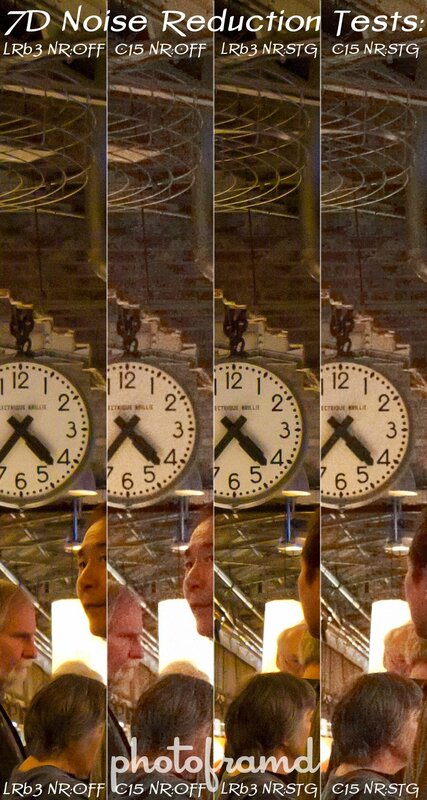 Update: when sharpened with an amount close to 150, I do achieve the same kind of low noise nevel seen with ACDSee. I’m just surprised that the defaults render such a terrible noise level in L3 though. Did you try updating to the new 2010 algorithm? Accessing Raw files which were previously used with Camera Raw 5.7 will default to the old algorithm. Take a look at this article. LR3 should work in a similar manner. Thanks for the tip! I haven’t used ACR 5.7 for the specific pictures I’m trying to process at the moment, but that might come in handy for the old ones!